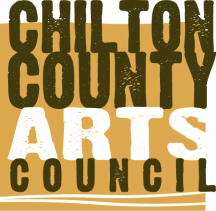 The Chilton County Arts Council met on January 8, 2017 prior to the Annual Members Meeting on the same date. President, Sue Anne Hoyt called the meeting to order. Those present were Sue Anne Hoyt, Maria Hosmer, Mack Gothard, Jim Wadsworth, and Charlotte Rowland. Charlotte Rowland read the minutes of the last meeting. There were two clarifications: the class that was taught at the YMCA by Maria Hosmer was not sponsored by the CCAC; and Mack Gothard will seek to be bonded as treasurer of the Arts Council. President’s Report: Sue Anne asked those present to think of ways to get more people involved and participating in the Art Council. She stated that most members only participate in the Art Festival as vendors and do not get involved in other Art Council activities. There was no Vice President’s report as the vice president was absent. Events: Mack Gothard reported that plans are being made for March Gourd Madness which will include participants from several different places. He also stated that the Alabama Gourd Society would meet the 3rd Saturday of March at the Arts Center and the Center would be open for Open House on each Saturday during March. Plans are also being made for March Gourd Madness to be held the last week-end in March of 2018 at CPAC. Grants and Sponsorship: Sue Anne Hoyt said the Council will continue to apply for additional grants and will ask for sponsors from community organizations. Rose Gallery: (Sue Anne Hoyt) Activities planned so far include March Gourd Madness and the Juried Art Show in May. Education: (Sue Anne Hoyt) Children’s art classes will still continue, once a week. --May Juried Art Show: (Charlotte Rowland) A discussion on ways to revamp the show ensued because the show lost money last year. Although final plans have not been made, it was decided that no monetary awards will be given this year. Instead ribbons will be awarded for Best of Show in both categories (Fine Art and Fine Handcrafted Art) in addition to ribbons being awarded for 2nd and 3rd place and Honorable Mention. A participant may enter a total of 2 pieces and the entry fee will be $10 for each piece. Of the $200.00 allotted amount in the budget, $50.00 is to be spent on advertisement. --Dues: Dues are payable on January 1 and delinquent on March 1. Art Festival vendors pay their dues at the time of the festival for the next year. It was clarified that the Vice President is chairperson of the Membership Committee and is in charge of keeping membership records and publishing member information. A form is to be designed that will indicate what information the member wants published. --Plans are being discussed for hosting a performing arts event at Chilton County Performing Arts Center in 2018. --The lease for the building is up for renewal. It was agreed that a representative of the Council would approach the city mayor concerning moving the Center to another location. --There are extra chairs, tables and wall art that will be offered to members in exchange for a donation. --The interior of the facility needs to be painted. --The website needs to be updated and maintained. ​The meeting was adjourned by President Sue Anne Hoyt.